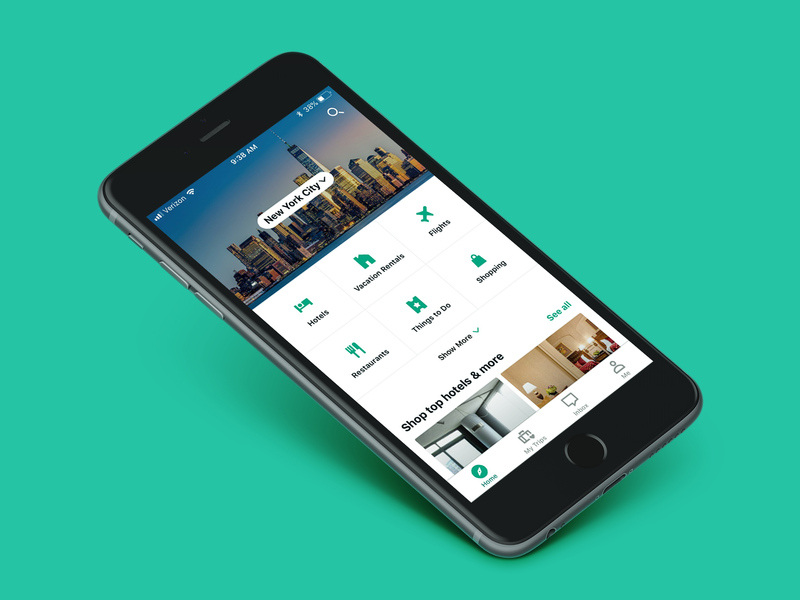 TripAdvisor Cross Platform Experience – NATCo. 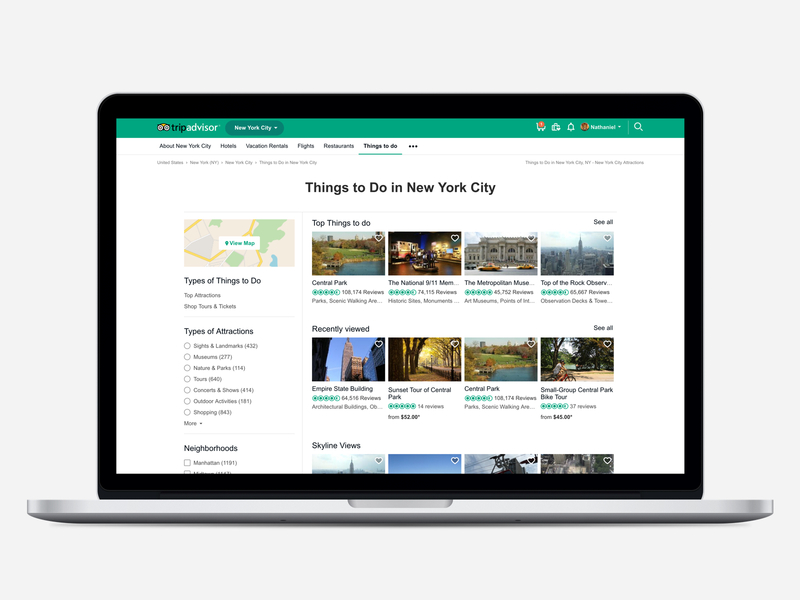 TripAdvisor provides travelers with the wisdom of the crowds, helping them decide where to stay, fly, play, and eat. 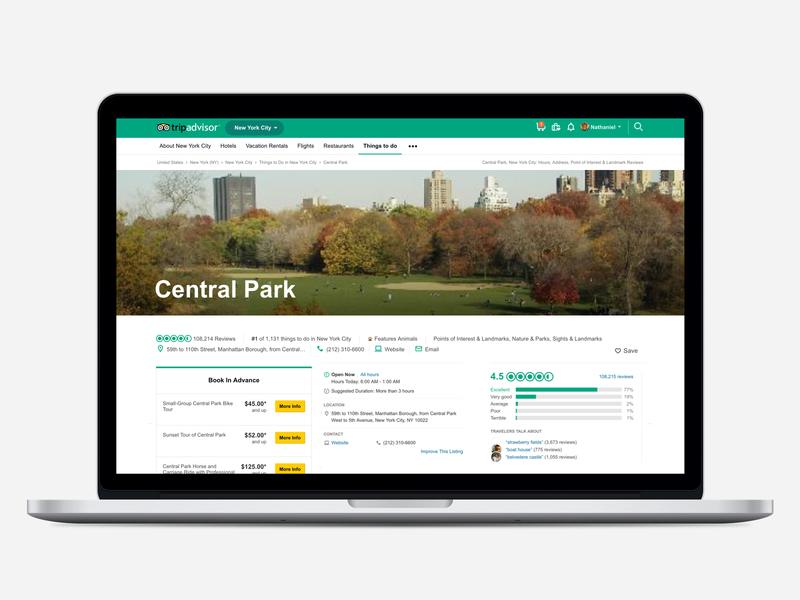 As a Product Design Lead on Personalization, Engagement and Bookable Tours, I worked with product and engineering in connecting 390 million monthly unique visitors to the best, most relevant travel experiences. 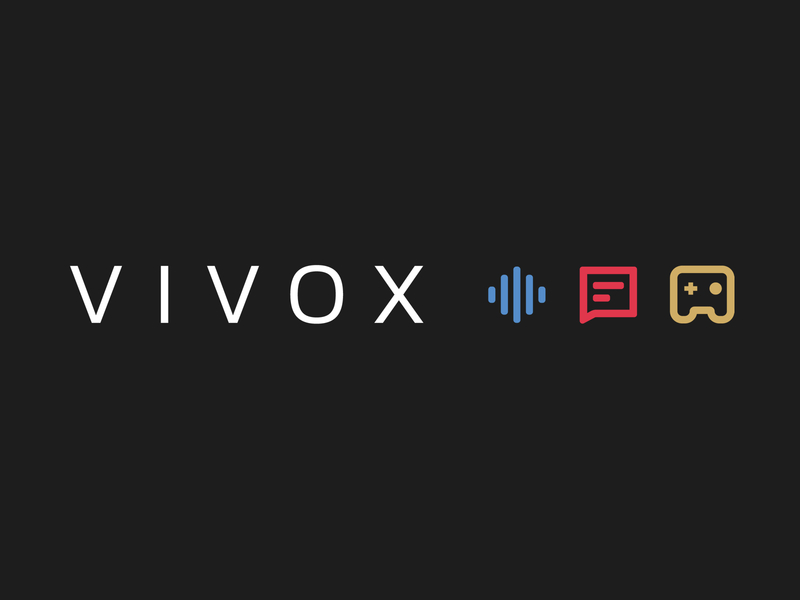 For the recent global redesign we introduced a new architecture, tested and deployed corresponding UX/UI patterns. It was a giant shift for the company where business units had operated in silos at the expense of our users. Our solution was to integrate our various businesses in a way that jived with the way people plan and experience travel. Top down, the cover page pattern let us provide context for geographic destinations. 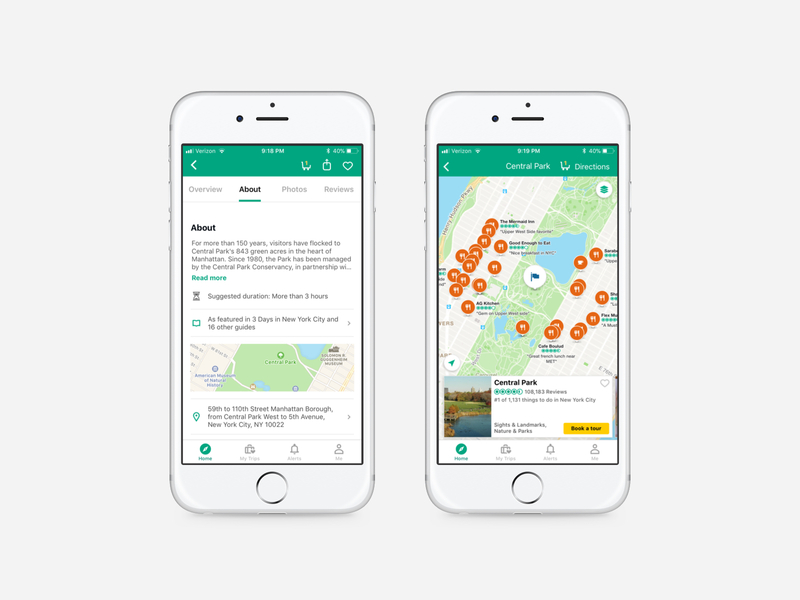 Surfacing pertinent content and inventory from each offering (Hotels, Restaurants, Tours, and Guides), a user would be able to quickly plan a trip to NYC for instance by scanning down the page to each section. The Attractions work went further down the funnel providing structure to data according to the way consumers research activities and make bookings. 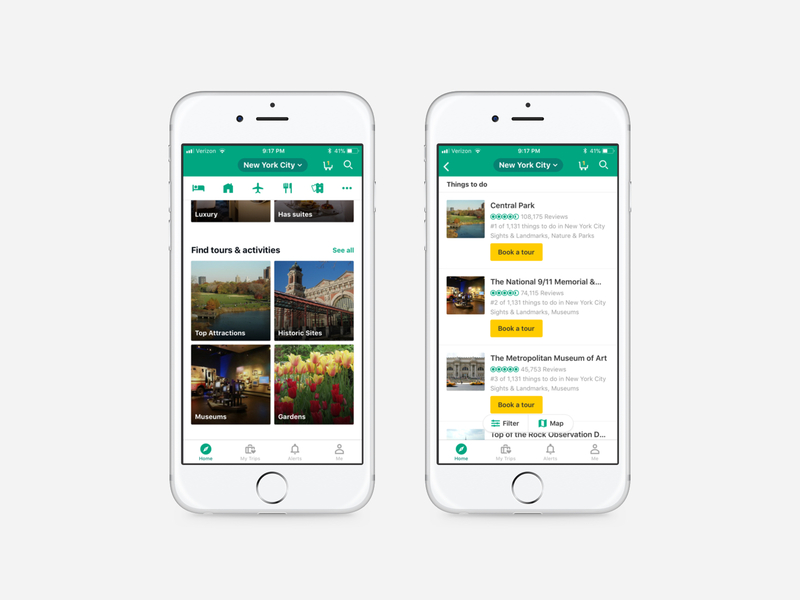 In the original app design, users commented that it was difficult to determine the difference between an informational page about a landmark and a page detailing a bookable product to the landmark. 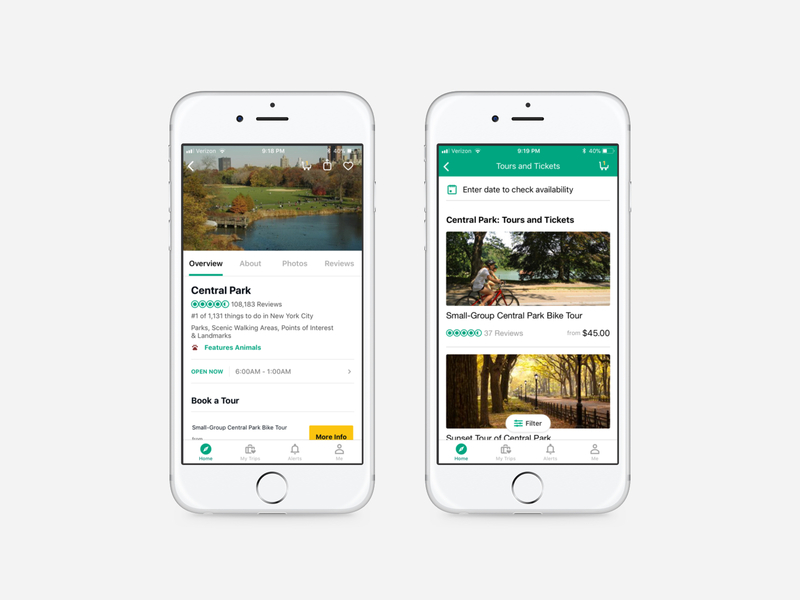 In our redesign we split the two into their own respective verticals- places and activities so once a user had the right information about an attraction, they could then book the perfect tour. 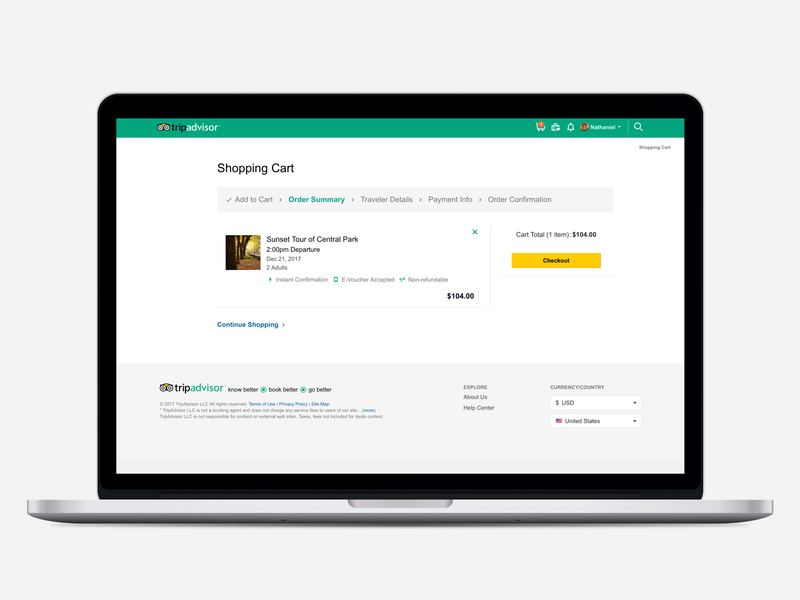 With the redesign, we also introduced a true e-commerce UX with a shopping cart. 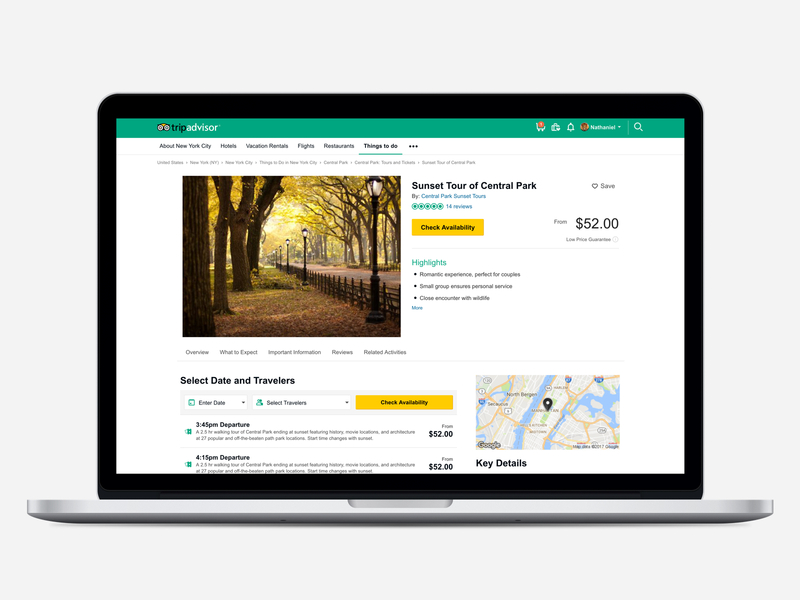 Users can now add multiple tours to their cart and then check out with one credit card payment. 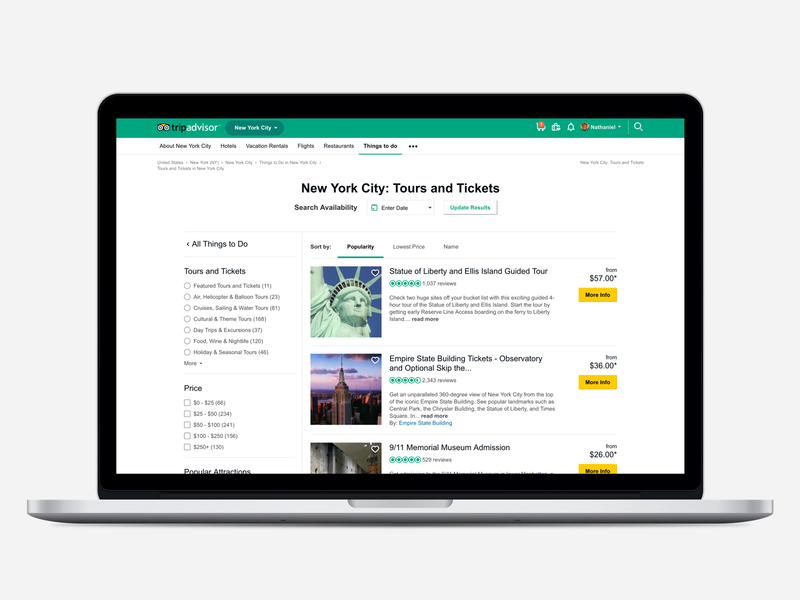 In the past a user would make a single booking directly on the tour listing. 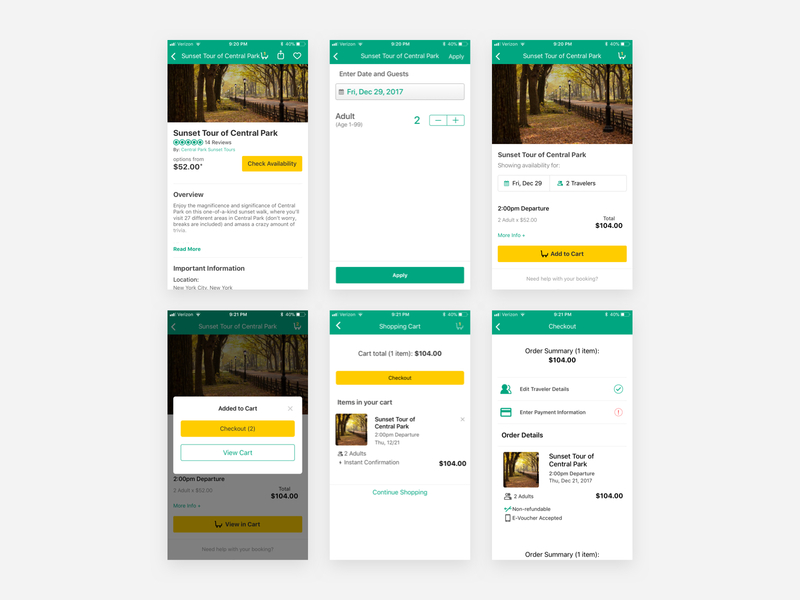 We refined our offering by creating clarity for shoppers explaining when something was instantly bookable or if they had to wait for confirmation. Working as a cross-unit design team, I collaborated with fellow designers in re-shaping our visual language. 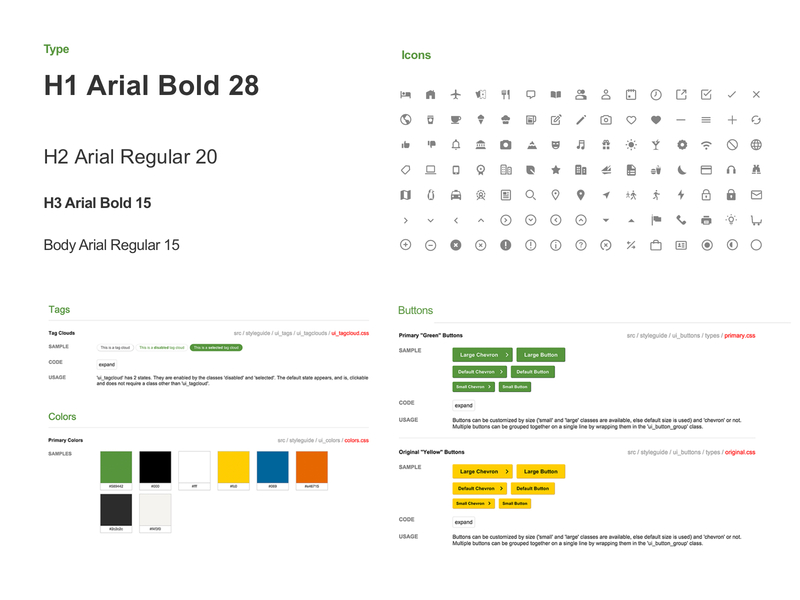 Together we launched larger design initiatives including a company adopted style guide.